Ten Ryu Dragon Samurai Swords for sale are 41 inches in all. 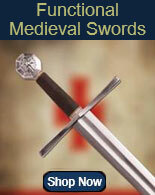 These handmade swords feature a functional 28 ½ inch carbon steel blade with a sharpened edge. The hand forged and hand sharpened blade is 7.5 mm thick and features a traditional blood groove. The high carbon steel blades are heat treated and cooled for strength and flexibility. 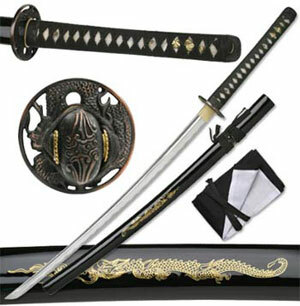 This katana has a dragon motif featuring detailed dragon scales on the tsuba. The shiny black lacquer wooden scabbard features a golden dragon inlay. 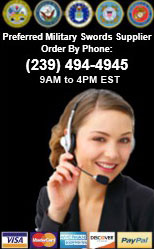 The handle features a black cotton wrap over real ray skin. 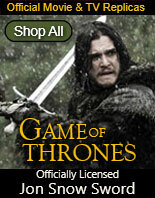 These swords also include a storage bag. 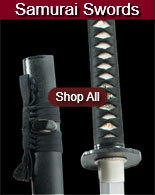 Buy the Ten Ryu Dragon Samurai Swords for $99.99.